You'll be £13.50 closer to your next £10.00 credit when you purchase Nursing Through the Years. What's this? Nursing has always been a challenging but rewarding profession. As part of the core healthcare team, nurses take responsibility for the care they provide to patients, displaying both compassion and discipline in their daily work. Demanding professions require rigorous training, and nursing is no exception. 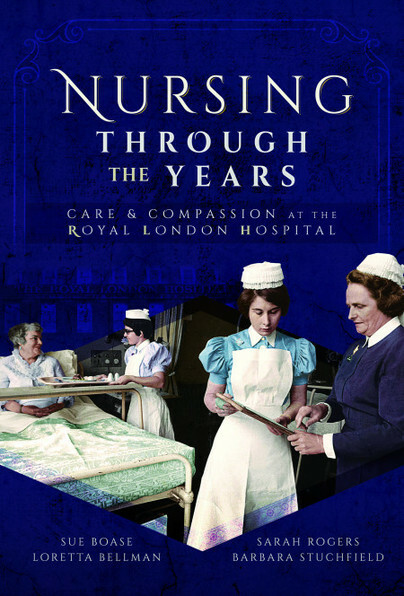 As the real story to ‘Call the Midwife’, Nursing Through the Years is a unique book that spans eight decades to reveal the fascinating lives of nurses who trained and worked at The Royal London Hospital, serving the community of the East End of London. Having interviewed over 85 nurses, whose experiences span from the 1940s to the 2000s, this important account captures the memories of their time at The Royal London. Exploring each decade, the extent to which nursing has developed and changed, and the highs and lows of training to be a nurse in a renowned teaching hospital are recalled in detail. It is a treasure chest of recollections which are informative, entertaining, inspiring, enlightening and also controversial, often challenging the myths and misconceptions that continue to surround nursing today. This wonderful account of the life of nurses, mostly told in first person accounts, and running from 1940's London to today, is not just a book for former staff or even for those who are glued to Call The Midwife. It's shocking, funny and eye-opening and, in its way, it's a slice of social history. The individual voices of eighteen year olds arriving in London, mostly from sheltered middle-class homes and with varying expectations and degrees of innocence, are matched with the lives of the often impoverished community around the hospital. The East End, which The London Hospital served, had suffered greatly in the Blitz. Patients often stayed in hospital for weeks so relationships were forged between the medical staff and those they looked after. For trainee nurses life seemed to linger a decade or so behind the outside world. This was probably most noticeable in the 60's with its its giddy city mix of mini-skirts, Biba, peace and love. Back at the nurses' home, a strict regime prevailed in which keeping student nurses and (male) medical students apart was an obsession, albeit not always successful in its aims. Nurses assembled their lacy caps, prayed together before the shift and scrubbed every bit of equipment under the eye of a stern sister. This is the rich material of Carry On Doctor films, which act as a sort of very British saturnalia to the reality. It's also a world in which patients, too, were subject to the rigours of institutional discipline, but one that ensured their best care in a safe environment. For the young women, who grew up fast, cared for and respected the endurance of the patients, it is a way of life that faded away with medical advances, changes in the structure of nursing careers, the improvement in living conditions of the poor and the merging of ancient hospitals. It was, sort of, fun while it lasted. Love this book! It brought back wonderful memories of my training days at The London - now The Royal London. It was fascinating to read of the wartime experiences of some of my predecessors working during the Blitz, and the dreadful damage and suffering that war time bombing brought. In addition, the onset of the NHS and the introduction of penicillin were also to herald changes in the role of nurses and the hospital. I also found it equally interesting to read of some of my successors, experiencing ‘Project 2000’ which moved nursing education across the country from hospital schools of nursing into universities and also caring for the more recent victims of bombing in the terror attacks on London on 7th July 2005. The book also contains some thoughtful discussion about the changing role of the nurse and for me, a message that while so much has changed the essential role of a nurse, to care for people with compassion, remains. At the Royal College of Nursing’s annual congress last year, I heard the author and nurse, Christie Watson, give an address in which she remarked on the dearth of nurses’ stories, alongside the plethora of doctors whose memories and reflections have become best sellers in recent years. She decided to address this by telling her own story in her book, ‘The Language of Kindness’ and she called on nurses to do the same. It is good to see this book giving a voice to over 85 nurses and their experiences across eight decades. A moving and informative account of nursing at the London Hospital, from the 1940s to the present day. The narratives of nurses who trained and worked there will resonate with nurses everywhere, and capture the joys, stresses and varied experiences that nursing brings. To have such a precious treasure-trove of memories is a rare and thought-provoking gift. Beautifully created and curated book written by Royal London Hospital Nurses from interviews with nurses who trained at the hospital over the last 80 years. ⭐⭐⭐⭐⭐ Get it while you can! Fantastic book - a must for any ex Londoner! The co-authors of Nursing Through the Years all trained at ‘The London’ and are members of the League of Nurses. Their career development encompasses clinical, community and academic work within the UK and beyond, including Australia, Canada, Europe, Japan and the USA. They feel privileged to have undertaken the project and to have produced the book, the prized outcome of their collaboration.